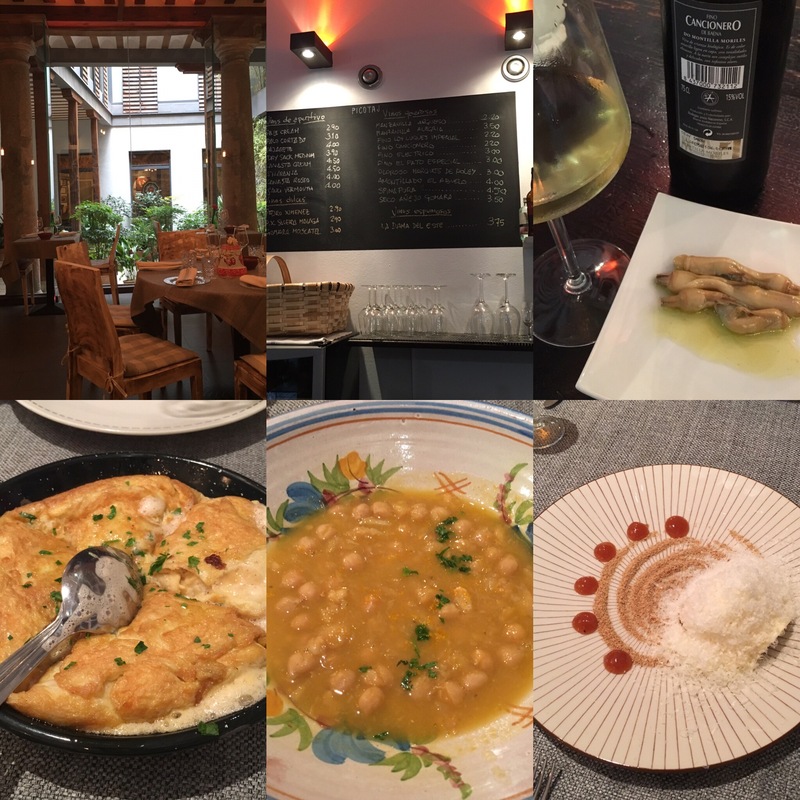 I finally made it la Malaje today for lunch and you have to wonder why it took me so long – absolutely top class. It is in a really nice spot at the bottom of Calle Relatores and has a nice airy feel to it, with a little Andalucian patio included (was a good day for it today, October notwithstanding). These dudes are from the other place, Montilla Moriles, and so it was a good opportunity to try a few of the other kind of finos from a longish list by the glass. Also, there were no fewer than three Andalucian red wines, two varieties of bread, and two different salts (but just one superb olive oil). More importantly, the food was cracking – navajas en escabeche, a herring and orange salad (no photo taken) that was brilliantly light and fresh, a really light, juicy tortilla, brilliant garbanzos, again with fish and a touch of citrus, and a cracking cheesecake (these are the names I have imaginatively given the dishes – you would be advised to consult the menu to see what they really are). To be honest I didn’t expect any less since the man in charge is Manu Urbano, formerly of Sacha, and the food here was definitely on that kind of level. So no excuses from me for not making it before – just regrets, and a determination to be back again soon (for Sherry Week).